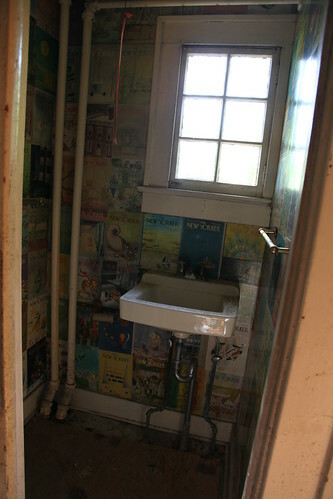 Matching the decor of the adjacent room, this bathroom was also covered in home made wallpaper. Here, the wallpaper was all 1950s through 1970s covers from the New Yorker magazine. Perhaps they were fans of the New Yorker, or perhaps, they felt that the New Yorker's place in the home was in the bathroom. Also notice the relatively new sink, in contrast to the lead pipes we discussed earlier.